After years of intense fighting, the armies of the north and south have reached a stalemate along the 38th parallel. As the representatives of each country meet at Panmunjom to thrash out a treaty, there is one area where the war hasn’t ended; a solitary hill, which changes hands daily as each side pushes to extend their side of the border. 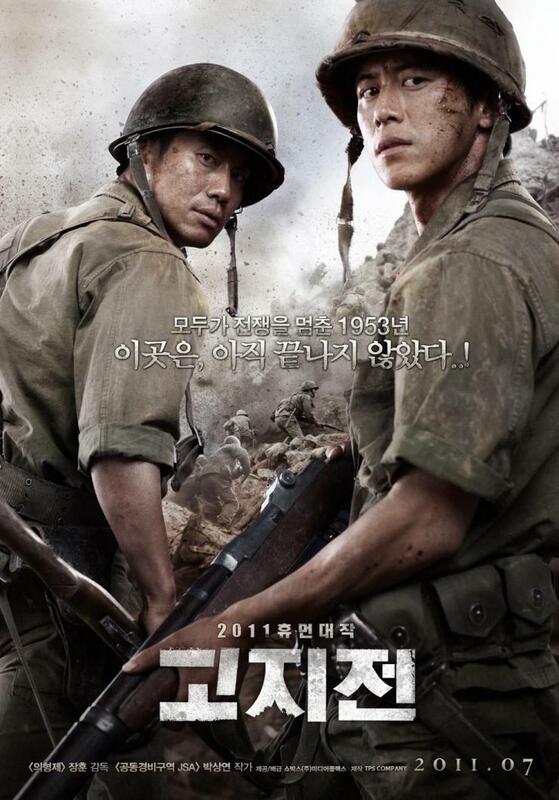 This is the context within The Front Line (고지전), a stark and bleak narrative about the insanity of war, the stupidity of those in charge, and the lack of value that life has during conflict. What follows is a classic case of ‘whodunit’ as Eun-pyo must find the culprit before it’s too late, yet he must also fulfill his military duties as a soldier and fight alongside the very group he is investigating, to reclaim the hill once and for all. Director Jang Hoon (장훈) and cinematographer Kim Woo-Hyung (김우형) must be congratulated for their amazing visual prowess as the battle scenes are incredible to behold. 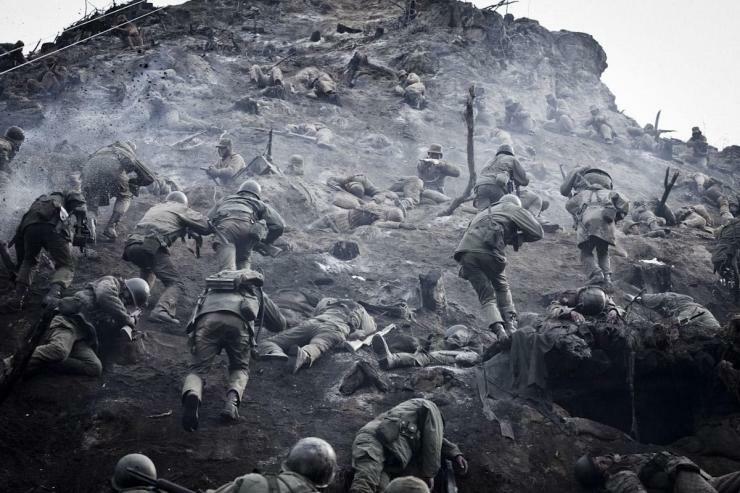 The beautiful but deadly vertical landscape is awash with mud, bodies and blood, but still the soldiers press on through trenches and jagged rocks. The sepia and washed out filters, combined with the hand-held camera movement places audiences in the center of the hike-and-fight confrontations, and drain any sense of hope and promise from the narrative. The techniques in which Jang Hoon films the hill connotes an unforgiving behemoth that can never be conquered, a barren wasteland build on the bodies of those who tried. Combined with the way the protagonists refer to it with personality traits, the hill becomes not only an insurmountable obstacle but also a discernible character in its own right. The camaraderie between the soldiers is pivotal in The Front Line. Despite flaws, including morphine addiction and mental instability, the soldiers stick together as they have bonded through the horrors of warfare. When military leaders attempt to give orders, which are often ludicrous, the men tend to either ignore or refuse to follow them as they are keenly aware of the ramifications. In a country and institution so heavily reliant on obedience to superiors, the generals easily become figures of ridicule and stupidity. It is this camaraderie that makes Eun-pyo’s task so difficult, as his objectivity begins to waver as he is inaugurated into the brotherhood and the loyalty it provides. Even when representing the northern soldiers, director Jang Hoon shows the bonds between them as equally strong, yet are slightly different as senior officers such as Oh Gi-yeong (오기영) (Ryoo Seung-soo (류승수) are also involved, connoting perhaps the ideological differences. It is ultimately respect and survival instinct that enforces the ties between the soldiers, traits that the superior officers are connoted as lacking. Yet, despite the beautiful cinematography and powerful notions of camaraderie, The Front Line is not without faults. The crux of the story – the insanity of fighting for a hill – becomes almost redundant under the weight of other convoluted narrative threads. This serves to lessen the intensity and futility of the situation(s) throughout the film, although in the final moments the impending sense of doom and the horror of war is thankfully revisited and enforced to poignant effect. The various narrative tangents also undermine Eun-pyo’s mission, the results of which are far from original and explored to greater effect in films such as JSA – Joint Security Area (공동경비구역 JSA). It’s a shame given the potential of the premise, for what could have been a powerful debate on the futility of war has resulted in a merely quite interesting one. However, The Front Line is certainly worth watching for the sumptuous art direction and heart-wrenching finale, and serves as another poignant reminder that ‘The Forgotten War’ is nothing of the sort.